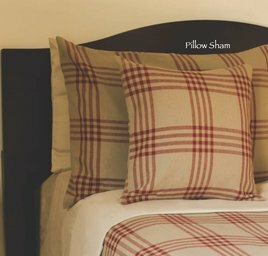 The timeless Chesterfield Check Barn Red Pillow Sham is a great finishing touch for your country bedding. Made from 100% cotton. 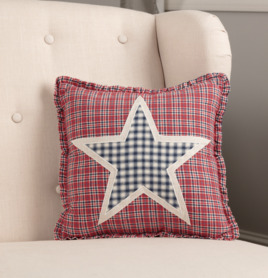 The Hatteras Star Pillow celebrates farmhouse style with a red, white, & blue plaid background with a blue & white check star outlined in thick cotton fabric. Ruffle on edge to add a touch of country charm. Reverses to blue and white ticking stripes. 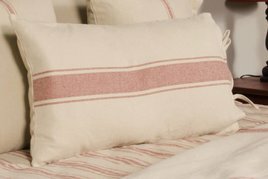 The Oat & Barn Red Grain Sack Stripe Lumbar Pillow Cover has a timeless design. Bringing a touch of simplicity that makes a clean statement. Made of cotton this lumbar coveris 27" x 15". Be sure to check out the entire Grain Sack Collection! Add farmhouse style with the Hatteras Seersucker Blue Ticking Stripe Sham. This Americana sham gives off a cool ocean breeze, vintage vibe featuring popular ticking stripes with quality seersucker material to enjoy for years to come. The Sawyer Mill Red Farmhouse Living Pillow is a great way to add to your farmhouse style! This pillow features stenciled words that say Farmhouse Living with grain sack stripes above and below. 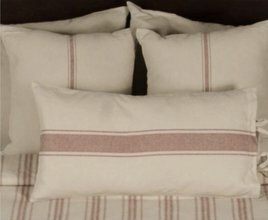 The Grain Sack Solid Oat Pillow Sham coordinates with the Barn Red & Oat Grain Sack Stripe Collection. 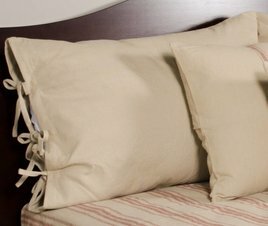 Measuring 21" x 31" this pillow sham is made with 100% cotton. With its neutral ream color, it would brighten up any room. 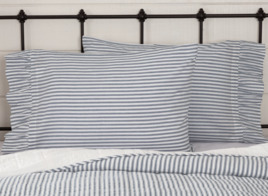 The Sawyer Mill Blue Ticking Stripe Pillow Case Set completes the look of your bed with a classic, vintage feel. 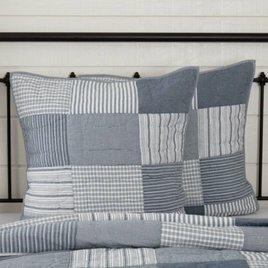 Featuring denim blue & soft white ticking stripes on beautifully textured cotton fabric, finished with a ruffle at the opening. 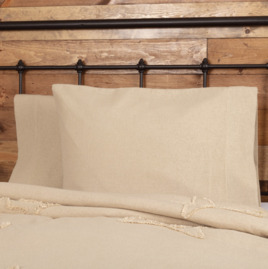 Complete your farmhouse look & accessorize your bedroom. 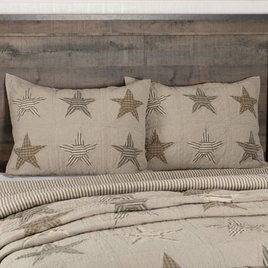 This sham showcases 6 country stars, each alternating in a variety of colored fabrics on textured solid chambray cotton base. Reverses to multicolored gray grain sack striped cotton. The Sawyer Mill Blue Farmhouse Pillow features a large FARMHOUSE & a grain sack stripe above & below the wording, stenciled in distressed white, across the center. 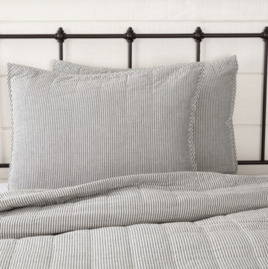 This 14" x 22" pillow reverses to denim blue, soft white striped & 2 button closures.